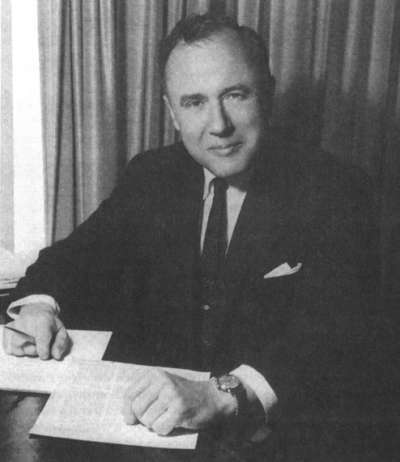 John Archibald Wheeler was the leading physicist in residence at Hanford. He solved the riddle of the B Reactor going dead a few hours after it started, an event that threatened to delay seriously the first production of plutonium. Early in his career at Princeton, in 1939, Wheeler and Danish physicist Niels Bohr collaborated to develop the first general theory of the mechanism of fission, which included identifying the nuclei most susceptible to fission, a landmark accomplishment that helped make Wheeler, at age 28, world fa­mous among nuclear physicists. After the war, at Los Alamos, he directed the group which produced the conceptual design for the first family of thermonuclear weapons. He became interested in astrophysics and coined the term "black holes." In 1976, Wheeler joined the department of physics at the University of Texas at Austin, where he was interviewed. I was at Hanford in residence from July, 1944, until September, 1945, and before that I made a roundtrip from Pasco to Wilmington once a month on the train. Arthur Compton assigned me to be what you might call a know-how transferer from the Met Lab to Du Pont. My first experience was Thanksgiving Day 1942. We were meeting in Wilmington to decide where the plant should be. It was my function to bring in all kinds of factors that otherwise might be overlooked. As for example, the highest number of thunderstorms per year, or obvious ones like security or water purity, you name it, I had to think of it. You might call me father confessor to the project. Somebody who looked under the bed for things. I never thought of Hanford in terms of being a factory. There was a sense of adventure about it. I associate it with pioneering. I would think it was like the first steamship, that must have been exciting. The first airplane was excit­ing, the first locomotive was exciting. I feel these comparisons are the right comparisons. Hanford is a song that hasn't been sung properly. There was a great romance about it. The way to get the feel of that romance is to put yourself back at that meeting in Wilmington, when we had a map of the United States spread out in front of us, and different possibilities there for where this plant might be sited. Great expanses of land, it was almost as if you were Columbus deciding where you would go exploring, or as if you were setting up a new republic. Then, to pick that particular place, a most fantastic place. Whoever thinks of that northern state of Washington having a hot desert in its middle. That's a story one person in a hundred knows. And that beautiful, bright blue, ice cold Columbia River coming down through it, from the ice fields of Canada. Then, the history of the place, the pioneer settlers who had desperately tried to irrigate it, and had irrigated it. Then pouring in, all this caravan, all different ways of getting there during the war. Railroad, airplanes, cars. The variety of people there, that too was romantic. Those Okies and Arkies coming in, several hundred a night, being unloaded there at Pasco. Those beer joints with windows close to ground level so that tear gas could be squirted in. The immense mess halls, accommodating those thousands of people. To see all those tables, table after table of people. Gobble, gobble, gobble. As far as me getting the credit for solving the poisoning riddle, let no man be his own judge, but I can say I have seen no objection to that position. When the reaction died, the mood was excitement and puzzlement. It took the fact that it regained its activity to give the clue. Of course I had been working on fission product poisoning for a long time. My friends at Wilmington, especially George Graves, were always asking me questions that gave a chance to stimulate my imagination to dream up things I otherwise might not have thought about. Fermi. He was a marvelous person with a tremendous drive. We would go out on a Sunday morning hike, and we would be moving along at a reason-able pace that didn't kill anybody but certainly was not an old ladies' tea party. When the last quarter mile was approached, Fermi would speed up. He was going to be there ahead of anybody else. One Sunday afternoon, John Marshall, myself, and George Weil and Leona Marshall were at this concrete irrigation canal, with sloping sides, maybe 45 degrees, with three feet of water going down at some clip. Should we go in swimming? How would we ever get out? Some of us stretched a rope across so we could grab it. But Fermi, he thought that was sissy, he was going to see how you would get out if you didn't have a rope. So here he was being carried downstream, trying desperately to clam­ber up, and sliding back down, trying again, sliding down, finally he made it, his shins were bleeding. He was in quite a shape but he made it. That was Fermi. That's how he got things done. I lived in Richland with my wife and three children. They went to Sacajawea School, a romantic name. We worked six-day weeks, and I can recall going out on a Sunday with the children in the direction of the Horse Heaven Hills and the youngest child, maybe three, climbing a hill, the sun behind her golden hair. It was an absolute halo of color. I realized how the painters of old got the idea of painting halos. It was not an invention of man but a consequence of nature. By the way, have you ever held a piece of plutonium in your hand? Well, you want to do that because there is something it does for you. People at Los Alamos gave me a piece to hold. It was shaped like a half of a hollow sphere. It was nickel-plated so that the alpha particles from it would not reach the skin. But the marvelous thing about it was the temperature of it. Here, day in day out, producing enough heat to keep itself quite warm, not for 10 years, not for a hundred years, but for thousands of years. It gives you an immediate sense of energy capacity. At any rate, in the end it was indeed the plutonium that turned out to be the proper fuel, although of course there were backup propositions, such as the electromagnetic separation method for uranium. But there was nothing like the productive capacity of Hanford. Plutonium is like, what is the best grade of gasoline, super? Plutonium is the super-premium of fissile material. S. L. Sanger: This is an interview with Professor John Wheeler in Austin on December 4, 1985. My question was, when were you there actually in residence? John A. Wheeler: From July of 1944 until September of 1945. And prior to that time and afterward, I made a round trip between Richland and Wilmington once a month on the train. Sanger: Oh, you did? Before you went to Hanford, then, you were at Wilmington mostly? Wheeler: My first experience in Wilmington and being with DuPont—because after all, I'm an academic boy, and had been with the Chicago project until Arthur Compton assigned me to be what you might call the know-how transferrer from Chicago to Wilmington, from the metallurgical project to DuPont. My first experience was Thanksgiving Day, 1942. We were meeting to decide what site should be picked. We had a collection of sites from hither and yon around the country, and it was my function to bring in all kinds of factors that might otherwise be overlooked. For example, how many thunderstorm days per year the given locality has. There are of course obvious ones about security. There were ones about water purity. You name it, I had to think of it. Sanger: At that time, was Hanford one of the possibilities or not? Wheeler: Well, it gradually changed from one of numerous possibilities to the one in over a matter of a few weeks. Therefore, I did not go to the test in Chicago. I assumed that it would come out as it did. To me, it didn't hold any excitement. Sanger: Where were you then? Wheeler: I was in Wilmington then. Sanger: Oh, okay. That was December for you too, huh? Wheeler: Yes. I stayed in Wilmington more and more from Chicago. And then from Wilmington, I was more and more beginning to move to Richland. Sanger: Did you work much a lot with Dr. Wigner and the design group? Wheeler: Well it was, so to speak, two different groups going through the same thing. The group at Wilmington, we were figuring things out in our way. They were figuring things out in their way. And then we could compare notes. Sanger: Okay. Supposedly if you read the histories, there was a good deal of tension between the people at Wilmington, the engineers, etc., and the physicists back at Chicago. Was that so? Wheeler: Well, I would turn it around the other way. The DuPont people were laid back and agreeable. There were a few, just a few, of the Chicago people who felt that this wasn't something that ought to be left to the physicists: the engineers ought not to be in there. Fermi was all ready to go and build a pile all by himself. Sanger: I take it that Wigner was also fairly active in thinking the physicists should do it. Is that your memory? Wheeler: Eugene Wigner is an old and valued colleague, so I don't want to say anything critical of him. Sanger: Okay. See, I have spoken with him. He was very polite. Interesting person, to say the least. Well, yes. Just keep talking. I'm taking some notes and so. I just wanna hear what your recollections are. Wheeler: Well, Ray Genereaux. Did I give you his name? Sanger: Right. He's a chemist? Wheeler: That's right. And the cars that would arrive with supplies out there were in most cases directed [by him]—I mean the freight cars, because after all the freight car after freight car. These truck drivers out there, they wanted to know—[they saw] what was going into the plant, but [they did not know] what was coming out. Anyway, these cars all had his name on them. Wheeler: Well, you had to have someone here direct them. Sanger: What was Hanford like when you went there the first time? John A. Wheeler: Well of course then it was terrible, because irrigation had ceased, the trees were dying. Construction was just beginning and it took a while to get everything figured out to get it going. And of course, you go out to the mess hall, 50,000 people having a meal all together, but unbelievable silence. You and I, if we were sitting at a lunch table, we'd be talking. These people were eating, not talking. Wheeler: Eating. People would get served only as soon as the table got filled up. Then they had big bowls of this and that, and those would be brought around. They would pass them around and help themselves that way. It wasn't a tray and a counter proposition, as I remember it. Sanger: That's what I've heard, that when something was empty they would hold it above their head and somebody would take it and fill it. Why was it silent? Because they were interested in eating and not talking, or what? Wheeler: Well, you go around and watch your carpenters or whatnot on the building site, and see how much they talk. Sanger: That would've been what early '43, you’re talking about? Wheeler: Yes, '43. That would be beginning, say March '43, and going on through. There was still construction going on even late as in the fall of '44. Sanger: When you moved there, where did you live? Wheeler: 1407 Haupt Ave. H-A-U-P-T. In Richland. Sanger: Was your wife living with you? Wheeler: And three children, who went to the Sacajawea School. That was a romantic thing for us, who had read about her. And, the children can recall going out. Of course, it was six-day week, as you remember. But I can recall one Sunday going out with the children to the area outside, where there was a hill in the direction of the Horse Heaven Hills. This youngest child, maybe three, climbing the hill with the sun behind her golden hair, and it was an absolute halo of color. And then I realized how the painters of old got the ideas of painting halos. It was not an invention of man, but a consequence of nature. That was a terrific. It's amusing; we had our 50th wedding anniversary this past June. All the family was there, seventeen of us. And the children ran the whole show. They put on, among other things, a picnic on another island and a wonderful quilt with all the scenes of a past life depicted on it, each segment of the quilt done by a different child or grandchild. Beside that, they put on a play. What was the name? Excuse me. The name of the celebration was called Heaven on High, Heaven on High because the island where the children are in the summer is High Island. Wheeler: Yes. Heaven on High. And the title of the play that they put on was: Hell in Hanford. If you wanted to get the text of that, a Xerox of it, it might give a little flavor of what life was to the child of that time. Sanger: Oh, okay. They remember it pretty well, do they? Wheeler: Oh, yes. Absolutely! It was a great experience. Going on the train, DuPont had to arrange a transfer in Chicago from one train to another. People arrived pretty beat up. I of course had already been there some weeks. Sanger: What was your main responsibility at Hanford? Did you have one, or were there many? Wheeler: Mine was to act as a general consultant on all kinds of problems that came up. You might call it father confessor to the project, or somebody who looked under the bed for things that might be overlooked. Sanger: Was there any particular problem that would recur or not? John: Well, one problem was getting the slugs canned. That was problem one. People who had quite a lot of metallurgical experience were heavily involved in keeping them canned, so that they uranium would not come into direct contact with water. A perpetual problem, but gradually licked. The problem of the xenon poisoning, you've undoubtedly read about. Sanger: Okay. What was the, as you recall, what was the mood like when the reactor did die off? Sanger: It was not too long, was it, before you had figured out what had gone wrong? Wheeler: Well, it took this fact that it regained its activity, to give the clue. But of course, I had been working on fission-product poisons for a long time. My friends at Wilmington, and among them especially George Graves, were always asking me questions that gave a stimulus to my imagination to dream up things that one might have not otherwise have thought about. That's how come I gave a lot of attention to fission-product poisons. Sanger: Well, with the xenon poisoning and then they—the company—adding the tubes beforehand, were those two of the big surprises? Wheeler: They were directly related to each other. That was the biggest single surprise, but I certainly remember another important one—not so much a surprise as an important matter of principle. That was the question about whether another $200 million plant—I hope I have the figure correct—would have to be built to do chemical separation. That's a big and important question. Bill Mackey was the one who had to make the decision on that. It was a question of whether plutonium could accumulate by chance, in a quantity so large, by accident in one of reactor vessels that it would set off a chain reaction and then kill, ruin, and put out of action the separation plant. Since you were probably the most well-known physicist in residence, and I've asked a lot of people this, do you think that Hanford has a place in the Manhattan Project? Do you think that Hanford is as well known as the others? And if not, why would that be? Now just a little bit more. Yesterday, John Marshall said that he thought it wasn't, and that was because it was not particularly in place where science was done. Herb Anderson said that he always considered it a plutonium factory rather than a research center, like Los Alamos was, for instance. I would like to hear some just broad sort of perspective of Hanford from your memories of it on what it meant to the project and in the context of the whole operation. I think that nobody could better than you could probably since you were there, but you also had your fingers on other things. Wheeler: To me, the reason that Hanford was not better known was deliberate reticence on the part of the DuPont Company. The DuPont Company had, out of World War I, unfairly got pinned with a label. What was the label, now? Sanger: Merchants of Death, wasn't it? Wheeler: Merchants of Death, and they did not want to have that once again. They were doing it on a very careful basis of this $1 fee, so they would not be ever subject to accusation of doing it for profit. They were doing it as a national service. They looked it over very careful to begin with to make sure that they were doing something that really was important and something that really had a reasonable chance to succeed. Otherwise, they would not have been willing to go into it. Having reached that decision, the DuPont people decided go at it as carefully as possible. I asked one of them why he wasn't doing so and so himself, but he said, “That's too important. The first thing for me to do is to get enough people to do the job.” It was that sense of proportion of doing things right that made sure in the end it would be so successful as it was. I can recall going in early one morning to one upper executive. What was he doing? I've forgotten which one it was. He was dictating his recollections of the day before so that there would be a record, because my friends there told me that if they succeeded, nobody would pay any more attention. If they failed, they'd never get through investigating it, they'd have to have the records. But also, it was part of standard procedure to do those records as a way to keep track of how things went. There was, in the earlier years in DuPont, somebody whose name I have now forgotten who used to arrange meetings of executives. He himself was a higher-level executive. [Dupont executives met] to consider the way Dupont did business, and to try to make that the best possible way. The members of that discussion panel, that seminar group—I don't remember whether it met once every two weeks or once every two months—but the members of that seminar group prepared papers. And those, if I remember correctly, were even printed up, so that people really took them seriously. So to me, it was a fantastic experience to see this way of doing business and keeping a low profile, to return to your original question, was part of that. Now, I had to give this talk on Niels Bohr before the American Physical Society last year, and I have a copy of it around here. I began it by talking about one physicist from the DuPont project in the State of Washington, the producer of plutonium, meeting with two, Niels Bohr and his son on the streets of Washington, coming from the customer for that plutonium. It would be interesting to get the story on the relative importance attached to those two ends of the story: getting the fissile material and getting the explosive on the one hand, and putting a bomb together on the other hand, to get the relative importance of those two things from the Russian side. I have quite a stack of references I've gotten in the last few months of the Russian project, and how it was arranged and motivated, so that that might furnish an end to that side of the story. As it regards to importance in the end, it was indeed plutonium, which turned out to be the proper fuel, although of course there were backup propositions of the electromagnetic separation method. But they had nothing like the productive capacity that Hanford had. Sanger: My latest reading was that there was enough plutonium for two or three more bombs soon after Nagasaki, but apparently there wasn’t any more U-235. Do you know anything about that? Wheeler: No, I do not. If I do, I've forgotten it. Sanger: Yes. I think that that was the case because Hanford, I guess when it got going, was a more efficient or more volume producer than Oak Ridge. Sanger: Also, this is kind of a digression, I just wondered is plutonium considerably more efficient as a nuclear explosive than U-235? Sanger: What, half again as much? Wheeler: Yes, I don't have the number. Sanger: It seems like somewhere I read that, but I thought that was the case. Wheeler: Have you ever held a piece of plutonium in your hand? Well, you want to do that because there is something it does for you. Sanger: Where would you do that? Wheeler: Well, people at Los Alamos let me have a piece in my hand. Wheeler: It was shaped like half of a hollow sphere. It was nickel plated, so that the alpha particles from it would not reach the skin. But the marvelous thing about it was the temperature of it. Here, day-in day-out, producing enough heat to keep itself quite warm. Wheeler: For thousands of years. Not ten years, not a hundred years, thousands, millions of years. So, it gives you an immediate sense of the energy capacity of it. Sanger: Have you seen Leona Marshall Libby's book? Wheeler: Oh, yes. I've got it up there. Sanger: Yes, I think she describes that as like holding what, a baby rabbit in your hand, something like that. Wheeler: Right, exactly. That's a good way to describe it. Sanger: In your estimation, was there any scientific progress made at Hanford that you learned something about, in pure science terms there? Wheeler: Well certainly the most fantastic cross section of any nucleus ever found in the history of mankind, this xenon poisoning. That's really spectacular. I'm sure there were other findings, but I've never tried to think back over what they were. Sanger: What about Anderson's comment about, in his view, it was more of just a massive plutonium factory, basically. Is that a fair comment? Wheeler: Well I never felt it in those terms. I never felt it as simply a massive plutonium factory. There was a sense of adventure about it that I don't associate with any normal project. I associate it with pioneering rather than with a steady factory. The phrase “factory” conveys this sense of something that's going on and on. “Ever wert, art, and evermore shall be.” Whereas here, I would think it's more like the early days of the first steamship. That must have been exciting. The first airplane was exciting. The first locomotive was exciting. I think of it in that category. Sanger: He had never been there, so I talked to him mostly because of his work in the earlier with Fermi and the first chain reaction. So probably since he hadn't been there, I imagined he missed out on some of the adventure sense, which is understandable. Wheeler: I feel those comparisons are the right comparisons. Sanger: You probably worked when Dr. Fermi was there, very closely with him? Wheeler: I saw a good deal of him at those times, right. Sanger: Marshall said something that was kind of amusing the day before yesterday. He said that Fermi was outraged because nobody had told him about the shutdown to slowdown the reaction until several hours after it had started, because he was asleep, I guess, or away. He said that he wished they had called him immediately because then maybe he could have had a chance to figure out what had gone wrong before you did, which I take was just the musing sort of competitive sort of comment. Wheeler: Well, Fermi was just sort of built that way. He was a marvelous person with a tremendous drive. We could go out on a Sunday morning hike and we'd all go on at a reasonable pace that didn’t kill anybody, but it certainly was not any old lady's tea party. When the last quarter-mile had approached, he would speed up. He was always going to be there ahead of anybody else. Sanger: Everybody tells similar stories about him, in that sense. Wheeler: I may have told you that story about him in the irrigation canal. Wheeler: Some Sunday afternoon, John Marshall and me and George Wyle and Leona Marshall and John Marshall were in this concrete irrigation canal with sloping sides, maybe forty-five degrees with, I don't know, three feet of water in it going down this cliff. Should we go in and swim in it? Well, how would we ever get out with this wet side? And so some of us stretched a rope across a stream further down, or rather there was a pipe or something that we let a rope down from, so we could grab it when we got down that far. But Fermi, he thought that was sissy. He was going to see how you would get out if you didn't have a rope. So here he was being carried downstream, trying desperately to climb up and sliding back down, trying again further, climbing up and sliding down. Finally he made it. His shins were bleeding. He was in quite a shape, but he made it. That was Fermi. Sanger: Pretty competitive, I guess, to say the least. Wheeler: Yes, but that's how he got things done. Sanger: I think you once mentioned that Hanford, you thought, was—I think your words were “a song that had not been sung properly”? Sanger: Can you elaborate on that a little bit? Wheeler: Yes. I think there was a great romance about it. The way to get the feel of that romance is to put yourself back at the meeting in Wilmington, where we had the map of the United States spread out in front of us, and different possibilities there where this plant might be sited, and looking over this, that, and the other. There are these great expanses of land. It's almost as if you were Columbus deciding where you would go exploring, or as if you were setting up a new republic somewhere. And then to pick that particular place, a most fantastic place. Whoever thinks of that northern state of Washington as having hot desert in its middle? That's a story that one person out of 100 doesn't know. And that beautiful, bright blue ice-cold Columbia River coming down through it from the ice fields of Canada. Then the history of the place: the pioneer settlers who had irrigated and got things going. And then pouring in there, all this caravan pouring in and all the different ways of getting there. Talk of the ways that the pioneers settled America, it is nothing compared to the ways that people got to the Hanford area during the War—car, railroad, and airplane. The variety of people there, that too is romantic. Those Okies and Arkies coming in, several hundred a night being unloaded there at Pasco. [There were] those beer joints that had to have the windows close to ground level, so the tear gas could be squirted in. [There was] a number of murders per week. There was the immense mess hall that would accommodate those thousands of people. See all of these tables, and table after table people gobbled, gobbled, gobbled. Not one word of talk. [There were] the buses, and you'd follow a bus. You'd see in the back row all the heads would go down, and then come up all at once. A few minutes later, they'd all go down, and all come up. You know what that was? Gambling. Wheeler: They were throwing dice. Sanger: I've never heard that. That's good. Wheeler: Well, then they had a business about the security—the only plant put out of action during the war by enemy action. Sanger: You mean, when they had that fire balloon? Sanger: That was ironic, wasn't it? Wheeler: Yes. I think I mentioned that it was in The New Yorker mainly. Sanger: Yes, it was also in McPhee in his book, The Curve of Binding Energy, it is in there. Wheeler: He was a neighbor of mine in Princeton. Sanger: Oh, was he? That's one the books that got me interested in the subject, was that book, which was really not about the Manhattan Project, but it had considerable amount in there incidentally about it. Wheeler: Right. Okay. That's good. I got that. Well, so that to me was exciting. How about the contact from time to time with the people at Los Alamos? I could recall one trip going out from Wilmington to Richland and getting as far as Fargo, North Dakota on the Great Northern. Maybe I mentioned it to you? Then, the romance of the decisions. They were a real policy, the decisions. Take one of the biggest: that decision about whether a second separation plant would have to be built at a cost of $200 million or $300 million. And why should that be considered? Well, it could conceivably happen that through a sequence of mistakes in controlling the flow of materials through the processing plant, chemical separation plant, enough plutonium could accumulate that would give a chain reaction there and render the whole thing radioactive. I don't know whether you've read about the Oklo reactors in Africa? Sanger: Well maybe you mentioned that or I'd read about them. Isn't that mentioned in Leona Libby's book? Wheeler: It could well be. Sanger: I think so. I mean, they naturally occur in those fields. Wheeler: Yes, they naturally come together, and that above all is the most dramatic demonstration that's there nothing explosive about such a condition, that it's self-regulating. If it gets too hot, the water's boiled off and there's no longer the necessary amount of moderator, and the reaction comes to an end. And so, the reaction would have come to an end in this process vessel at Hanford, but things would've been radioactive around that and the functioning of the plant would have been hindered. Sanger: Did you have much to do with the chemical separation end of it? Wheeler: I had talks from time to time with people. I mean, there were questions about criticality, but not ordinarily, no. My most romantic association with the chemical processing plant was simply to ride around the site on the plant railroad one time. I had been given a ride by a friend and I don't know whether it was Saturday or Sunday or what, although, those were the days of course where everybody worked Saturday as well as the other five days of the week. But that plant railroad, the whistle of the train—that's me. Sanger: There's a very elderly man now still here in Richland named Oswald Greager. Wheeler: Greager, yes. He lives up at the north end of town. Sanger: Right. He had worked for DuPont, but then he went over to Corps of Engineers and was sort of the engineer's liaison at the separation plants. He is in his eighties now, and I talked to him too for the newspaper story. Not a single word of it got in the paper, but he gave a long, lucid explanation of how it worked. Sanger: Very courtly gentlemen. [He has a] big house along the river there, I think. In fact, he was one of the more interesting people I think I talked to in Richland. Sanger: Do you have any questions that you might suggest that I ask Dale Babcock when I see him? Anything that might be particularly illuminating? Wheeler: Well, ask about this demineralization plant. That's one of the most spectacular sights when you look at a picture of the Hanford Plant, and yet it wasn't used. Why was that put in as a precaution? And water treatment in general. There was a lot of attention given to that because that might cause real trouble. And then the covering of the slugs, that was a vital point to protect them from the water, protect the uranium from the water. Sanger: Incidentally, do you know where the uranium came from? Wheeler: No. I do not. Sanger: Who would know that? Wheeler: Ray Genereaux could well do. That's a good question of all these people here. Sanger: Marshall thought it might have come from Canada, but he didn't know. Sanger: He would know about it? Wheeler: I would think he would. No, wait. Walter Simon and Ray Genereaux. Those are the people I would think of, those three people. Sanger: There was uranium from Belgium or the Congo. I believe that the U.S. had some, but I think that they must have gotten most of it from Canada in those days. That was before the U.S. produced uranium, wasn't it? Also, I hope to talk with Professor [Eugene] Wigner. At least, he's said he will be in Princeton in March, and I spoke to him on the telephone some time ago. He told me frankly, he couldn't remember much about Hanford anymore. He was there what, just a few times. Sanger: Obviously since he helped design the reactors, would that be the area, I suppose, to emphasize? Wheeler: That's good. Now, I think I mentioned to you about the control rods. Did I? And about the Klaus Fuchs incident and all that? Sanger: I don't think—I don't remember. Wheeler: This was in October 1949. This was a meeting—I had been serving for the first seven years of its life, after the war, on the Reactor Safeguard Committee. And we decided to have a meeting jointly with the British Reactor Safeguard Committee and compare notes. We held it near Harwell in England. And there was half a dozen American members on one side of a long table and on the other side a half dozen or so British. We discussed, as usual when talking about such questions, the worst possible case, because that's what you figure back from and you would protect against that. One possibility—I don't want to stretch this all out—was to have a big tank of gasoline, a gasoline storage tank. And if the pile got out of control, out of radioactivity, first we didn't see any way that it could be explosive, but it would be simply that it could get so hot that the material would burn, catch on fire, and the smoke would carry radioactivity into the air. But how would you protect the population downstream from that radioactive smoke, if you will? The idea here was to set on fire a big tank of gasoline that would create a thermal source, a way to carry it up to the upper horizon. But we decided no, because if anybody was going to sabotage something, why you would just do that first? At any rate, after discussing the worst-case scenario, then we came to the question of what's the probability for an accident. I had been the one there most concerned with control rods and their function because my job was really looking for anything I expected, dreaming up new things that nobody had thought of. Say that one chance in a million, the first control system didn't work, then you still have the second one. One chance in a million for that, and if that failed, you'd still have the boron pellets that you could drop down the holes as a third system. One chance in a million-million-million that all three would fail. I argued that that mathematical scheme was absolutely wrong as a way to figure it. The right way to figure it is ask: What's the chance that somebody will come along who was so smart and so clued into the system that with a key he can turn off safety system one? He can turn off two, and turn off three. What's the chance of that kind of a person? I had collected, in preparation for this meeting, the statistics on sabotage in World War I and in World War II. My conclusion was that you could not make any mathematical prediction. It depended so much on the climate of opinion at that time. In World War I, there were a lot of German sympathizers in this country. World War II, we were never more united in our history than we were in World War II. So, who could predict what would happen in some future case? But I said that the thing you have to look out for is somebody who is so clever, so in on the engineering that he knows all of this, and so trusted that he can get through all the security system. It would be somebody who's a loner, doesn't tell anybody what he's going to do, somebody amazed by some strange ideology. While I was saying this, Klaus Fuchs was sitting opposite me at the table. Sanger: You don't remember if he had any reaction to this do you? Wheeler: I of course was not tuned in for that, but it was just a month later he was in prison. Sanger: Yes, he's exactly who you were talking about as an example of that. Wheeler: Yes. And did I tell you what Peierls said? Sir Rudolf Peierls who played such a big part in the project, who had hired Fuchs. Sanger: He was his mentor, more or less. “Oh, I meant to give control of the world to the Russians. I got this firsthand from Peierls, but that's how I remember it. Sanger: Yes. Fuchs is still alive isn't he? Wheeler: Fuchs, yes. I saw him, yes. Sanger: He's in Eastern Germany? Wheeler: In East Germany. He has a responsible position in the East German atomic program. Sanger: I wonder what that would be. Wheeler: I do not know how wide-reaching his responsibilities are. Wheeler: Every month saved would mean the difference of a half a million to a million lives saved. Sanger: Yes, right. And also, I think you mentioned peace? Wheeler: I said, the most important peacetime use of nuclear energy is preserving the peace. That's my peppy way of saying it. Sanger: Did you work on nuclear weapons after the war? Wheeler: About three years on the hydrogen bomb game. That’s why I have a picture Eniwetok there. Sanger: Oh, I see. Yes. And then, you left it what to go back to—? Wheeler: You're right, right. There was a big gap in there. I mean, I didn't want to work on the hydrogen bomb business, but I got a lot of heat put on me in early '50. I didn't want to do it, not because I didn't believe in it, but because I had other things to do. Copyright 1989 S. L. Sanger. This transcript may not be quoted, reproduced, or redistributed in whole or in part by any means except with the written permission of S. L. Sanger. Exclusive rights granted to Atomic Heritage Foundation.